India is building Solar Canals. Posted in Think Green!. 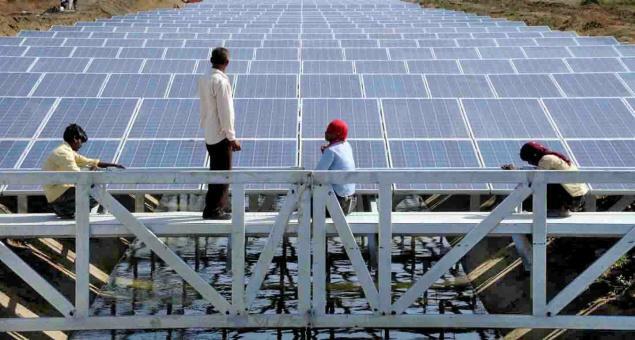 Tagged India is building Solar Canals, Think Green! 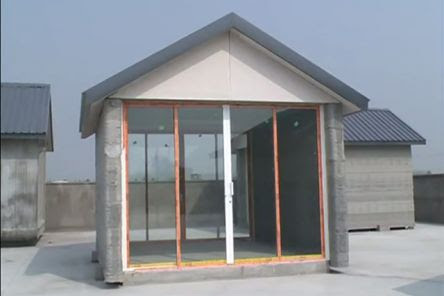 This Chinese Company Built Ten 3-D-Printed Buildings in One Day From Recycled Trash. Rome wasn’t built in a day, but the city of the future sure might be. A Chinese company, Shanghai Yingchuang Design & Engineering Co., has built 10 buildings in an astonishing 24 hours, and it has done it all with a 3-D printer. The 3-D-printed structures, which are in the Qingpu District, a suburb of Shanghai, are constructed of a combination of recycled industrial waste and a mixture of sand, concrete, and glass fiber. Similar to the world’s first 3-D-printed house, which went up in Amsterdam earlier this month, the building’s parts can be printed and then clicked together like Legos. 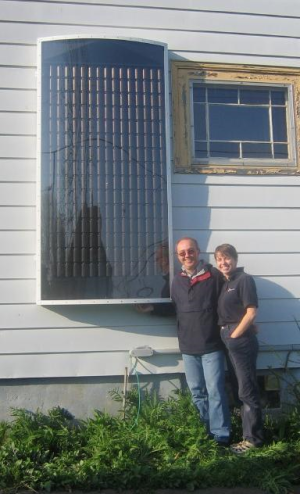 The design “can save up to 50 percent of the construction material,” said Ma. To read the full article and view the video click the link at the top! Posted in Think Green!. Tagged Build Houses From Trash., China, Think Green! 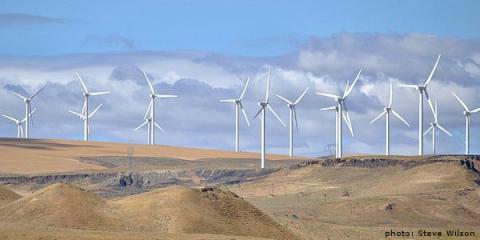 UN Panel Confirms Renewables, NOT Nukes, Can Solve Climate Crisis. Check Out These Amazing Towers In Ethiopia That Harvest Clean Water From Thin Air. Unveiling the WarkaWater Tower, an innovative new way to harvest safe drinking water in Ethiopia and other parts of Africa. Water gathering in Ethiopia can be an onerous and gruelling task, with trips to the nearest source often taking hours, if not all day. This task is commonly carried out by the females in the family, who are not only taken out of school, but may encountersexual harassment on the journey. The end result is also dangerous, as more often than not, the water that is collected is highly contaminated and harmful to drink. But, it seems that the VittoriLab has found a solution! The Warka Water Towers were inspired by the Warka tree, native to Ethiopia and commonly used as a central community gathering space. The tower, developed by architecture and vision is a vertical system that harvests portable, clean water right from the air through condensation. Each tower costs approximately $550, and can be built in a few days by village residents, and using locally available materials. 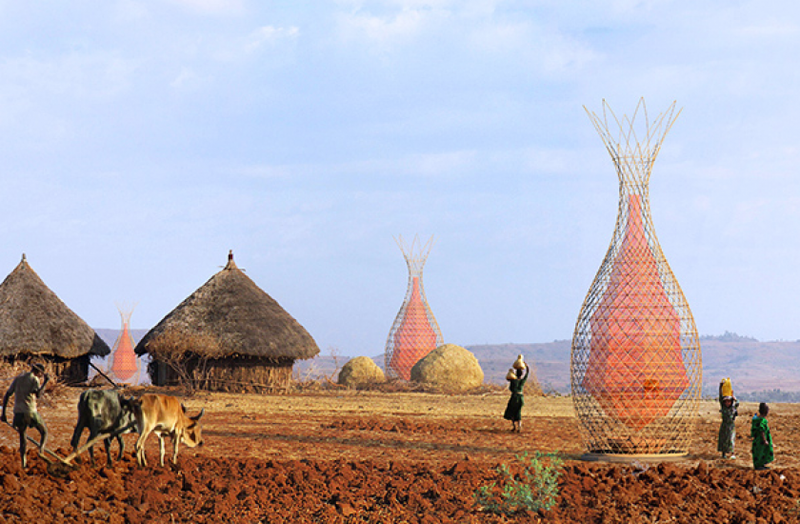 The Warka Water Tower uses a fog-harvesting fabric and can collect up to 100 litres of safe drinking water per day, and uses a fog-harvesting fabric. To read more, click the link at the top! Posted in Think Green!. Tagged Africa, Think Green!, Water-Harvesting Towers! Sugar-powered biobattery has 10 times the energy storage of lithium: Your smartphone might soon run on enzymes. As you probably know, from sucking down cans of Coke and masticating on candy, sugar — glucose, fructose, sucrose, dextrose — is an excellent source of energy. Biologically speaking, sugar molecules are energy-dense, easy to transport, and cheap to digest. There is a reason why almost every living cell on Earth generates its energy (ATP) from glucose. 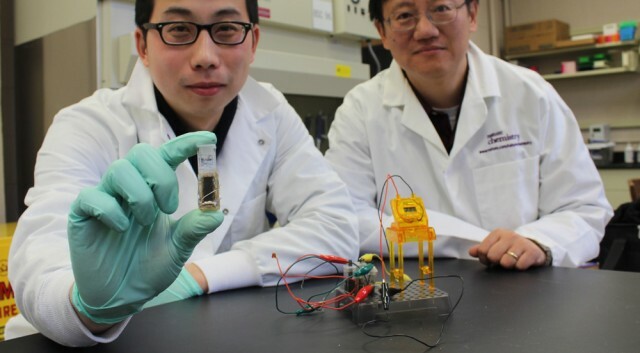 Now, researchers at Virginia Tech have successfully created a sugar-powered fuel cell that has an energy storage density of 596 amp-hours per kilo — or “one order of magnitude” higher than lithium-ion batteries. This fuel cell is refillable with a solution of maltodextrin, and its only by products are electricity and water. 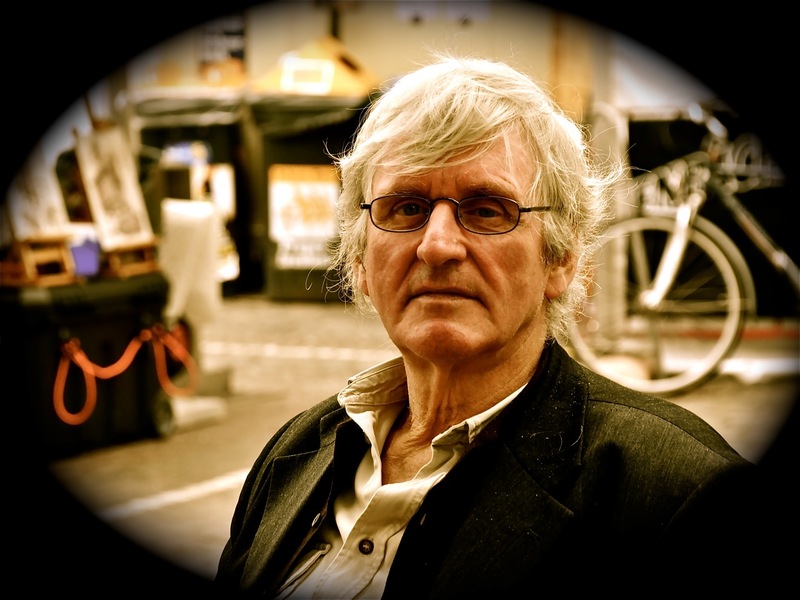 The chief researcher, Y.H. Percival Zhang, says the tech could be commercialized in as soon as three years. Now, it’s not exactly news that sugar is an excellent energy source. As a culture we’ve probably known about it since before we were Homo sapiens. The problem is, unless you’re a living organism or some kind of incendiary device, extracting that energy is difficult. In nature, an enzymatic pathway is used — a production line of tailor-made enzymes that meddle with the glucose molecules until they become ATP. Because it’s easy enough to produce enzymes in large quantities, researchers have tried to create fuel cells that use artificial “metabolism” to break down glucose into electricity (biobatteries), but it has historically proven very hard to find the right pathway for maximum efficiency and to keep the enzymes in the right place over a long period of time. Posted in Think Green!. Tagged Biobattery Fuel From Sugar!, Fuel From Sugar!, Think Green! Posted in Think Green!. 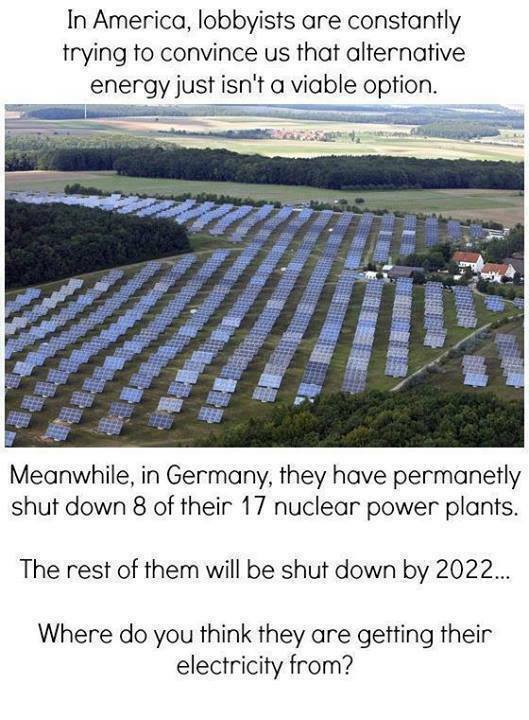 Tagged alternative energy, Germany, USA, viability?